Build Stuff, the book, finally arrives! 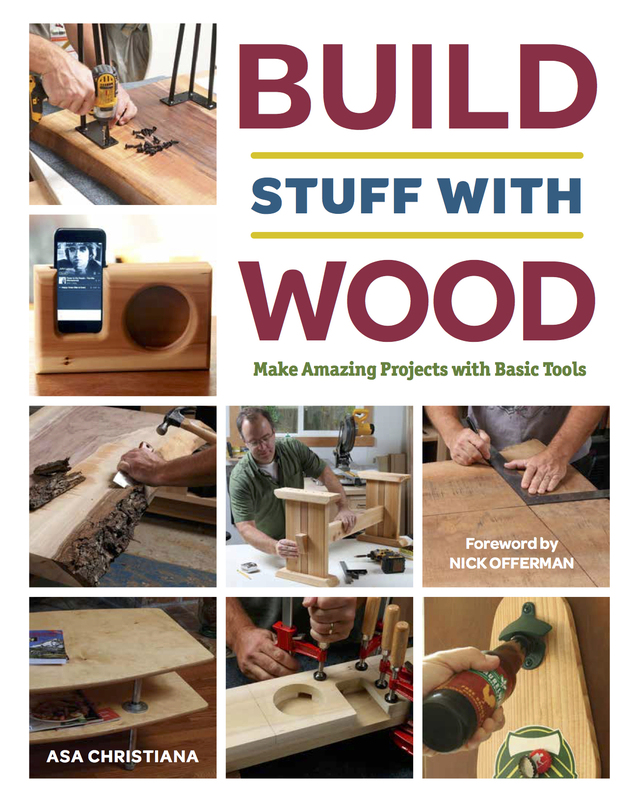 Build Stuff with Wood, a project book for true woodworking beginners, went on sale this week on Amazon.com. I finished writing and shooting it in 2017, but had to wait all this time until folks could actually see it and buy it! My deep hope is that it reaches its audience, folks out there who are inspired to build things with wood but just don’t know where to start. Unlike most of the other beginner books out there, this one has projects you can actually build, with basic tools and no previous knowledge. And all the projects are worth building. Most books fall short of one of those goals, presenting projects that are either deceptively difficult or totally uninspiring, especially to younger people. It’s not easy to design cool stuff that you can pull off with no skills and limited tools, then actually use. In many ways, I’ve been preparing a lifetime for this task. I learned at a young age how satisfying it is to build things, with my first model rockets, bike hacks, and illegal “forts” in the woods, made from scavenged lumber. I honed my skills in trade school, soaked up some engineering in college, then learned how people learn as a high-school and college teacher. I learned to write and shoot photos as a working journalist, and caught the woodworking bug big time when I bought my first house. I came to Fine Woodworking magazine as an entry-level editor, eventually rising to serve as chief editor for 7-plus years before heading west to Oregon to do things like writing woodworking books for beginners:-) At FWW I learned tons more about how woodworkers learn, and was exposed to a host of amazing techniques that let you do more with less. I created a number of video series for beginners, but ever really got a chance to teach folks with no skills or tools at all. My mission now is to spread the gospel of making things by hand. We need it now more than ever, as we live more and more on screen and in our heads. If you know anyone who is inspired make things but is still standing at the edge of the pool, please tell them about this book. Same goes for anyone with a few skills but little time, who is looking for quick, easy projects worth bragging about. True satisfaction is way deeper than temporary pleasure. And building and creating is the surest path I know to that inner sanctum. Purchased! I’m hoping this turns into one of those books I give my friends who are intrigued by the things I build. My neighbor is one of those. He’ll be getting this book after I do some pursuing. If things progress, I’ll follow it up with Offerman’s Good Clean Fun. If he continues down the slippery slope, I’ll buy him Schwarz’s seminal Anarchist Tool Chest. Fantastic! Let me know how you like it! Thanks Shawn. Can’t wait to get mine. Congratulations!